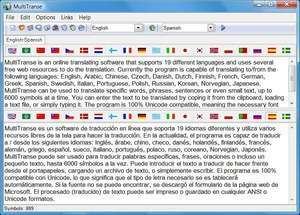 MultiTranse is a software that employs free online resources to translate to/from English, Chinese, Dutch, French, German, Spanish, Italian, Portuguese, Russian, Korean, Japanese and Norwegian (only English-Norwegian is available). MultiTranse can translate specific words, phrases, sentences or even small texts, up to 6000 symbols at a time. The program is 100% Unicode compatible, automatically determines font, encodes Unicode text into any ANSI format and the other way around. MultiTranse comes with a multilingual user interface that is very simple and easy to use. MultiTranse 7.0 is a shareware program and can be used as a demo to try the software until the free trial period has ended. A full version of the program is available after the trial period ends. For security reasons, you should also check out the MultiTranse download at LO4D.com which includes virus and malware tests. Additional screenshots of this application download may be available, too. MultiTranse has a presence on social networks.